Erected 1975 by Erected by Fairport Lodge No. 476 F&AM. Location. 43° 6.096′ N, 77° 26.543′ W. Marker is in Fairport, New York, in Monroe County. Marker can be reached from South Main Street (New York State Route 250) just east of West Ave.. Touch for map. 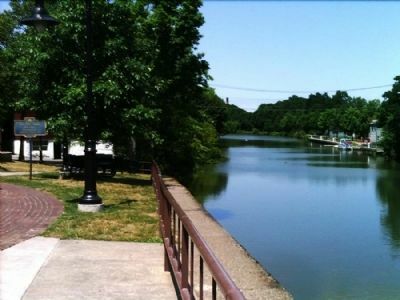 Marker is located in Kennely Park, between Fairport Village Landing and the Canal. There's a gazebo, and it's just off the sidewalk to the northwest of the gazebo. Marker is in this post office area: Fairport NY 14450, United States of America. Touch for directions. Other nearby markers. At least 8 other markers are within walking distance of this marker. De Land Chemical Co. (within shouting distance of this marker); Fairport Village Hall (about 400 feet away, measured in a direct line); "Old" South Main Street Yields to Urban Renewal (about 500 feet away); Spice Mill (about 700 feet away); The 20th Century Comes to South Main Street (approx. 0.2 miles away); The DeLand Family Develops Fairport's Four Corners (approx. 0.2 miles away); Erie Canal Inn (approx. ¼ mile away); The Potter Property (approx. 0.3 miles away). Touch for a list and map of all markers in Fairport. More. 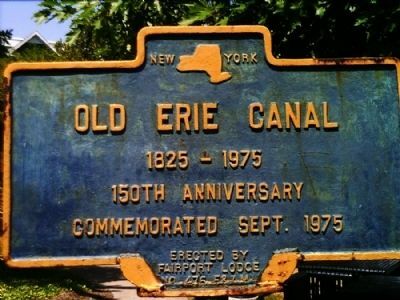 Search the internet for Old Erie Canal. Credits. This page was last revised on June 16, 2016. This page originally submitted on July 23, 2012, by Yugoboy of Rochester, New York. This page has been viewed 351 times since then and 5 times this year. Photos: 1, 2. submitted on July 23, 2012, by Yugoboy of Rochester, New York. • Bill Pfingsten was the editor who published this page.